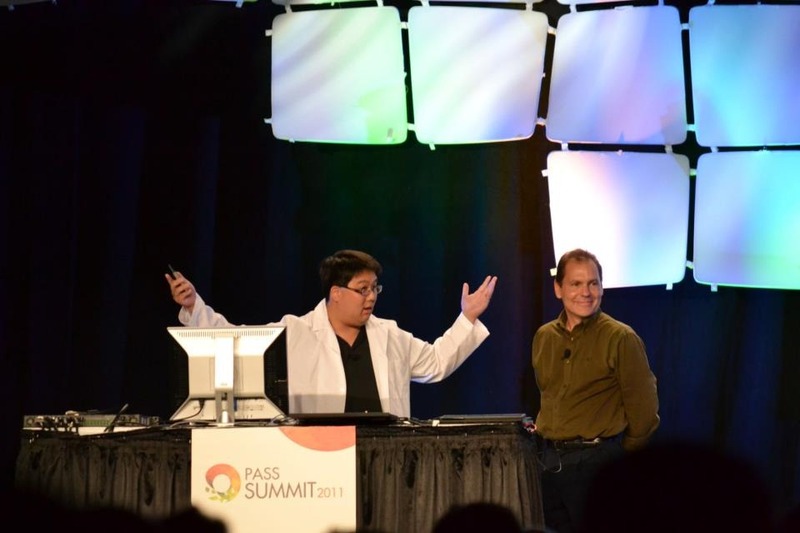 During the PASS 2011 Keynote (back in October 2011), I had the honor to demo Hadoop on Windows / Azure. One of the key showcases during that presentation was to show how to connect PowerPivot to Hadoop on Windows. 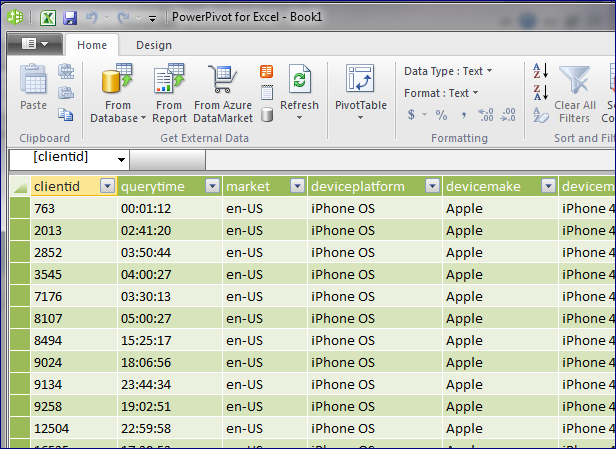 In this post, I show the steps on how to connect PowerPivot to Hadoop on Azure. 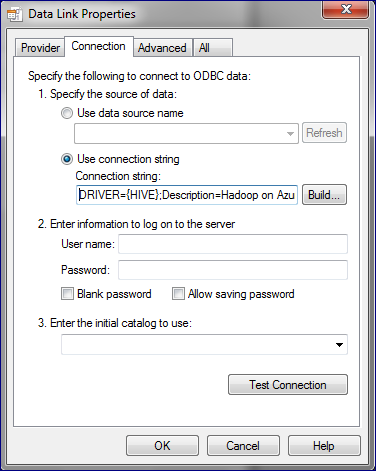 Here, we will go about creating a File DSN Hive ODBC Data Source. 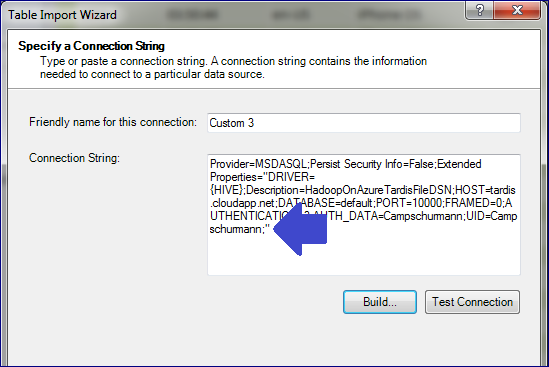 Thanks to Andrew Brust (@andrewbrust), the better way to make a connection from PowerPivot to Hadoop on Azure is to create a File DSN. This allows the full connection string to be stored directly within the PowerPivot workbook instead of relying on an existing DSN. 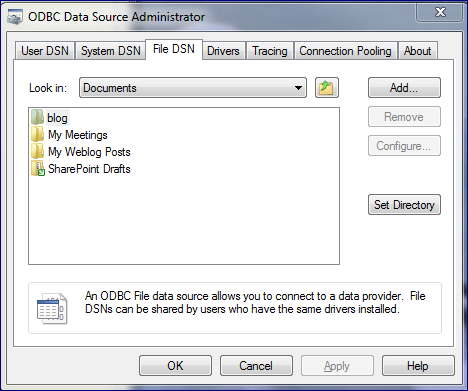 Go to the ODBC Data Sources Administrator and click on the File DSN tab. 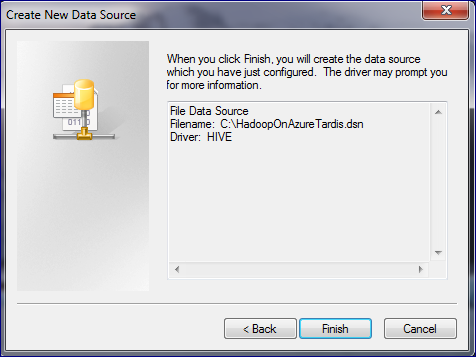 Click on Add, Choose HIVE, Click Next, Click Browse to choose a location of the file; click Finish. 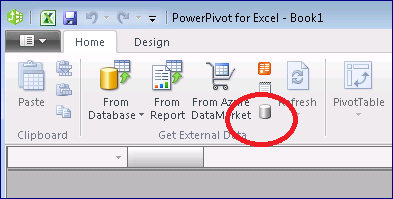 Open up the PowerPivot ribbon and click on the Get External Data from Other Sources. 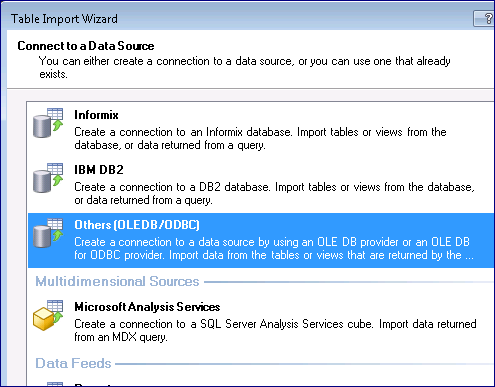 From the Table Import Wizard, click on the Others (OLEDB/ODBC) and click Next. 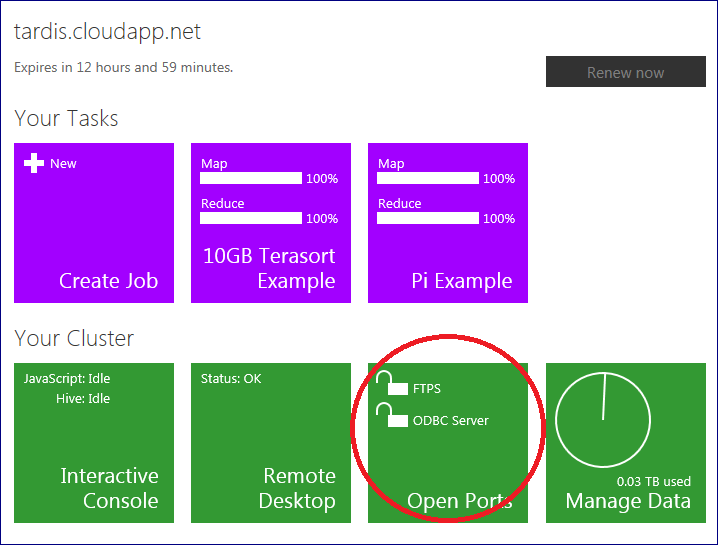 From here, click Build and the Data Link Properties, click on Provider, and ensure the Microsoft OLEDB Provider for ODBC Drivers is selected. Click Next. In the Data Link Properties dialog, choose “Use connection string”, and click Build and choose the File DSN you had created from Step #2. 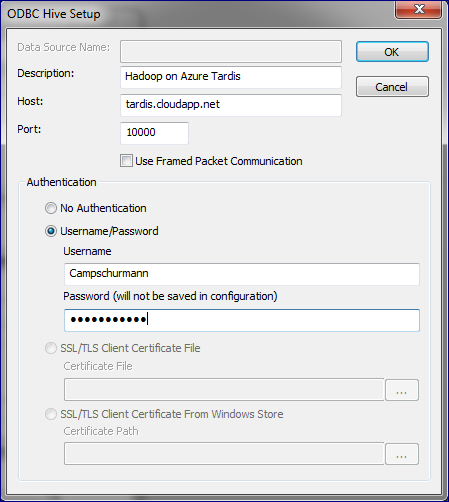 Enter in the password to your Hadoop on Azure cluster. Click OK. The Data Link Properties now contains a connection string do the Hadoop on Azure cluster. Note, after this dialog, verify that the password has been entered into the connection string that that has been built into the Table Import Wizard. Note, the blue arrow points to a lack of a PWD=<password> clause. If the password isn’t specified, make sure to add it back in. Click OK, click Next. From here you will get the Table Import Wizard and we are back to the usual PowerPivot steps. Choose your table (e.g. 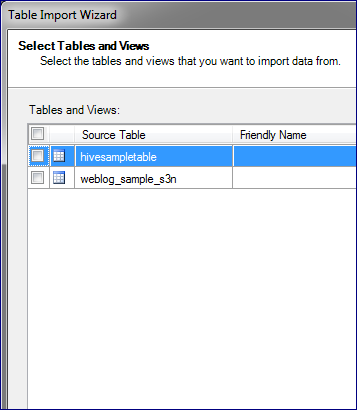 hivesampletable) and import the data in. It looks like a lot of steps but once you get into the flow of things, it’s actually a relatively easy flow. Great demo, thanks for this. i’m trying to follow your demo but i’m experiencing problems : cannot turn port 10000 on. each time i set it on, when i come back to setting page it’s off again… ever heard about this ? Please let me know when this issue is fixed. ok it works nows. Thank you for resolving. I haven’t personally tried it on AWS yet but it should be compatible with Hive 0.7.1. Checking AWS’ documentation at http://aws.amazon.com/elasticmapreduce/faqs/#hive-9 – it appears that their Elastic Map Reduce 0.20 and 0.20.205 both support Hive 0.7.1. So it should work provided that the ports are open to allow for that type of connection. Worst case scenario, you can setup your HadoopOnAzure cluster and connect to Amazon S3 from Azure.